The government is making preparations for the Coronation of HM King Maha Vajiralongkorn and the election will be held after the completion of this important ceremony, said Prime Minister Prayut Chan-o-cha on Tuesday. State agencies are expected to draw down just 70% of this fiscal year’s annual investment budget, well below the target of 87%, says the head of the Comptroller-General’s Department. The cabinet approved a draft decree on tax discounts and waivers to promote the establishment of international companies’ headquarters in Thailand, said Government Spokesman Lt Gen Sansern Kaewkamnerd. The government continues efforts to implement the Thailand 4.0 policy while welcoming opinions from all sides on helping to achieve its goal. he National Innovation Agency (NIA) has united with the Petroleum and Petrochemical College of Chulalongkorn University in an effort to find ways to advance the bio-refinery industry with a focus on sugar cane, tapioca and oil palm. Former foreign minister Surapong Tovichakchaikul has been sentenced to two years in prison for issuing a passport for Thaksin Shinawatra. At a recent U.S. Trade Representative hearing, National Pork Producers Council called for Thailand’s preferential access to the U.S. market to be revoked or reduced if it does not end its unwarranted ban on U.S. pork. Starting from the next academic year, 80 top Thai Grade 9 graduates will be offered full scholarships to study at renowned technology colleges, known as Kosen, around Japan as part of government efforts to offset an acute shortage of highly skilled labour for the Eastern Economic Corridor (EEC). The Thai government has announced it has selected Airbus to manufacture Theos-2, an earth observation satellite that will replace Theos (also known as Thaichote), the country’s first earth observation satellite launched in 2008. Thailand is set to address a bilateral Thailand-Britain free trade agreement (FTA) during a six-day European trade mission led by Prime Minister Prayut Chan-o-cha, starting Wednesday. Thai regulator NBTC has been forced to cancel a planned 1800-MHz spectrum auction after none of the market’s three operators registered to participate. The National Legislative Assembly is getting ready to host a meeting of the Standing Committee on Social and Cultural Affairs of the Asian Parliamentary Assembly (APA) in 2019. The Industrial Works Department has suspended the licences of five importers of scrap electronics after they allegedly hired illegal factories to recycle more than 14,000 tonnes of the hazardous garbage. The Anti-Money Laundering Office has asked the Counter Corruption Division (CCD) police to investigate Putthipat Lertchaowasit, a former permanent secretary of the Social Development and Human Security Ministry, and a former female official of the ministry who was his close aide, for alleged money-laundering. Baidu Access, the ad management company under Chinese internet giant Baidu, has joined hands with TCC Network Technology and TCC Business Centre to help Thai entrepreneurs enter the Chinese market effectively. Thailand’s B.Grimm Power has signed a cooperation agreement with Vietnam’s Xuan Cau to develop the largest solar PV project in Southeast Asia, standing at 420MW capacity in Tay Ninh, southwest Vietnam. 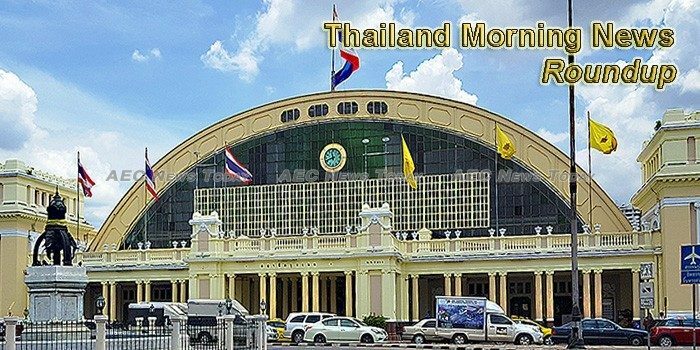 BANGKOK Mass Transit System (BTSC) is interested in joining the bidding for showpiece rail and road infrastructure projects that will upgrade the country’s transport network, chairman Keeree Kanjanapas said yesterday. The Department of Internal Trade (DIT) has explained measures to do with wheat imports in response to accusations the Ministry of Finance and the Ministry of Commerce were being neglectful in the collection of duties, assuring the public that efforts are being taken to maintain the price of such economic crops. The Ministry of Agriculture and Cooperatives and Tesco Lotus have continued their cooperation in buying 9,000 tons of rice from agricultural cooperatives in four northeastern provinces. The rice deal is expected to boost incomes for more than 140,000 farmers. The first roll-out ceremony for BTSC’s 22 new four-car trains by Bangkok Mass Transit System and Siemens took place at the factory of the German firm’s partner Bozankaya in the Turkish capital, Ankara, on Tuesday. Maize farmers in Chiang Mai have expressed grave concern that their produce will have no buyers after they learned that about 120,000 tonnes of barley have been imported into the country as animal feed. The Labor Minister, Pol. Gen. Adul Sangsingkeo, said the Ministry of Labor aims to find jobs for about 100,000 unemployed graduates within three months. Forty two macaques have been released into their natural habitat of King Kaew Mangrove Forest after they were neutered to control their population. The Thailand Travel Mart Plus ended successfully on 15 June with positive feedback for the new format launched by the Tourism Authority of Thailand (TAT) to make travel trade shows more focussed and relevant in changing times. TOSHIBA Thailand yesterday announced ambitious growth targets, setting its sights on becoming the third-biggest producer in the country’s electrical appliance market within three years.